Doing a Blender panoramic render isn’t easy. This is because you can’t actually see what you’re going to create in the regular OpenGL-shaded 3D view. 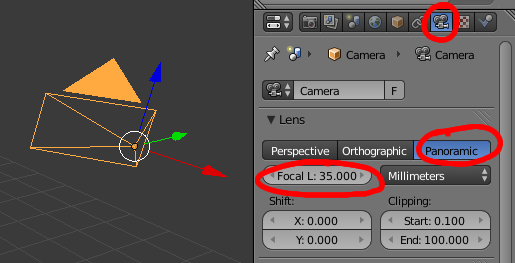 In fact, even when looking through the Blender camera, you won’t see what you’re going to end up with. You’ll soon discover is that you can only actually see what you’re going to get when you hit the render button. If you’re using the internal Blender renderer, this’ll become a pain really quickly. This is because you’ll have to constantly hit render and wait for the image to come up. However if you switch the scene to Cycles Renderer, things become easier. This is because Cycles provides a real-time rendering view. Just set one window open to rendered view and you’ll see what you’re going to get (roughly) in real time. At the same time, you’ll notice that Cycles opens up new options on how your panoramic render should be like: the type of panoramic - whether it’s fish eye, equidistant, or rectangular, and how many degrees the field of view is. Now comes the fun part, actually building your scene. The best strategy is to have planned out your scene beforehand on paper so you know its composition. With panoramic renders, if you haven’t already got a scene built, now is your chance to bend reality in a Dali-esque manner and have fun with perspective. Once your composition is planned out, create simple cubes and planes as proxy objects for the rough locations of where your scene objects are going to be. Then slowly replace them with the more detailed meshes of what you want to make. Another useful tip is to use the Blender preview window. In Cycles, when in camera view, just press shift-b and drag and drop a cropped portion of your screen, and it’ll only render that area. This keeps rendering times low. There are plenty of other tips on how to reduce rendering times, so I won’t repeat them all here. Below you can see a panoramic render I did a few months ago which uses the above techniques. As you can see, I’ve blended several scenes together with varying perspectives, which was only possible with a panoramic render. Good luck, and create those awesome renders!